1. 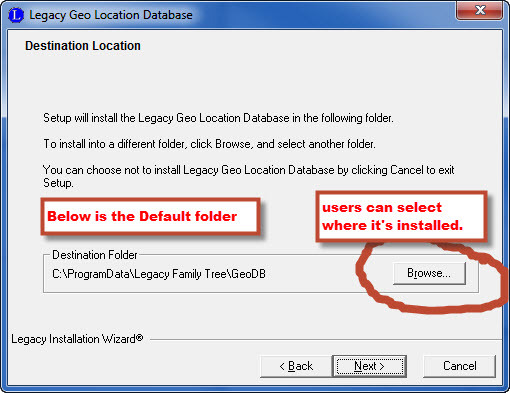 The easy way to get the Geo Location Database is to download the installer from http://www.legacyfamilytree.com/GeoDBDownload.asp. Make sure you are signed to your computer as Administrator when you download and to temporarily disable your internet security. 2. Run the installer and browse to the installation location. 3. Open Legacy and then click on Tools > Geo Location Database. 4. The Geo Location Database will initialize and rebuild its indexes. When done it will be ready for use.